I'm very excited to be participating in the Allen & Unwin My Hundred Lovers read-along being hosted by 1 Girl, 2 Many Books. The read-along commences on 1 June and I'm just one of many book bloggers participating in the event. We're all very excited to be taking part, and many of us have been visiting each other's blogs, saying 'hi' on Twitter and leaving comments here and there. 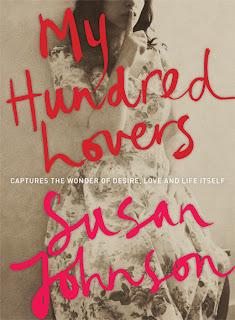 Incidentally, I noticed that Cheryl Akle has selected My Hundred Lovers by Aussie author Susan Johnson as the June book club book on The Circle, and I'll be looking forward to watching the segment online after the read-along. So, what's the book about you might be wondering? Blurb: A woman on the eve of her fiftieth birthday, reflects on one hundred moments from a lifetime's sensual adventures. By turns humorous, sharp, haunting and wise, this is an original and exhilarating novel from one of Australia's premier writers. If you'd like to join me in the read-along, leave a comment below and I can post updates on my progress. Counting down now until 1 June.